Today, many loader manufacturers offer wide range of mini track loaders, specially engineered and designed to satisfy the needs of professional landscapers. But, deciding which mini track loader is the best for the job can be quite a tricky challenge for landscapers. The most important aspects characteristics that need to be considered when a mini sized loader is being a subject of a purchase are the loader power performance, power capabilities, attachment options, lifting capacity and capability, track configurations, mobility, etc. Landscaping require a powerful machine that can complete different tasks effectively and efficiently. This means that the selected mini track loader needs to offer versatility and mobility so it can be used for different applications. Performance Capabilities – One of the most important aspects that require close consideration when a mini track loader needs to be selected, is simply the power performance of the machine. The ideal horsepower to weight ratio and the use of proper direct drive motors equal powerful lifting and pushing capability, excellent maneuverability and faster load transportation speeds. Another key aspect of the mini track loader power performance is the machine hydraulic power capability. This is important because some landscape projects require track loaders equipped with proper attachments that provide excellent power performance thanks to their excellent hydraulic flow systems. A Variety Of Attachments For Different Landscaping Tasks – When speaking of a mini track loader attachments, for a proper landscape irrigation installations, a vibratory plow or a trencher is important consideration for landscapers. For ground cleaning operations, attachments like stump grinder, rotary cutter, chipper and a flail cutter are best. Different bucket types, such as the grapple bucket are needed for clearing sand, rocks, brush and debris. For site preparation tasks, the soil conditioners, box and dozer blades, laser guided graders, tillers, landplanes and the landscape rakes are very useful attachments. In addition, a silt fence installer can be a very useful attachment that lowers the erosion control cost. Sod laying and seed laying attachments are other tools used in landscaping. Lifting Capacity And Capability – The lifting performance of the mini track loaders is another key factor. Larger loaders, when compared with the mini sized track loaders, are usually designed and engineered with higher operating capability which enables them to manage big and heavy loads. Some loader manufacturers offer mini track loaders with different arm designs. The landscapers can choose between a loader with a vertical lift path, or a loader equipped with a radius lift path. A loader with a vertical lift path has higher lifting capacity and can reach full lift height. On the other hand, a loader with a radius lift path, lifts the load in an arc position which provides great reach. Mobility – The width and the length of the mini track loaders can have a direct impact on the pressure and the traction of the ground. Narrow track loaders provide excellent traction and ground pressure on hard and slippery ground surfaces. 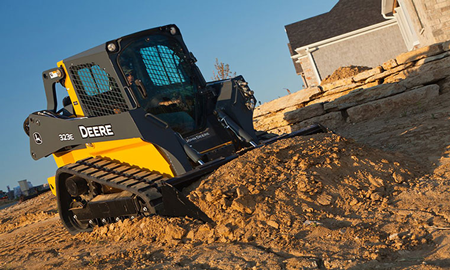 Landscape professionals can consider a more wide track loader option in order to lower the pressure on the ground, and also, to increase the ground flotation especially when working under sandy, wet or muddy conditions.